This wraps up my recreation of our conversation, and I hope it's been half as interesting and edifying to read as it was to actually sit and talk with Becky and Peter. BG: What is the biggest change in Burgundy from 30 years ago until now? BW: It's a generational change. The kids went to viticulture school and their equipment and wine making is super clean. Clean is an inexact word, because when you walk into the cellars they're still covered in the beautiful furry mold, but everything is clean. And they're interning with wineries all around the world. They taste at each others places now - Roumier, Grivot, and others, they go to each others' places for lunch and to taste. That wasn't common in the old days. Another issue is land pricing. Real estate price is now more important than the revenue you can earn from the wine on it. Land is so expensive in Burgundy now that its out of the hands of Burgundians, and that was never the case. You have to have financial backers if you're buying decent land in Burgundy. PW: There has been change in the wine making too. 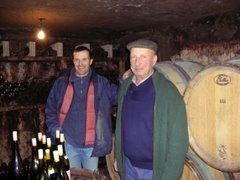 There were pioneers - Lafon, Roumier, Arlot, Dujac - their first focus was on achieving a base level of cleanliness (Becky again doesn't exactly agree with the word 'clean'), but then they realized that you don't make a wine in the winery, you make better wine with a better vineyard and a better plant. BG: Where do you stand on organics and biodynamics? BW: We check the biodynamic calendar before opening a fine wine. PW: (Chuckles) Yeah, but we have no dogma on this. You don't have to be biodynamic for us to work with you or to make great wine, there are no technical requirements. We never say to wine makers that they should do this or do that with their wines. The biggest intervention we ever have is to introduce a young wine maker to another wine maker whose wines we like, and hope that they hit it off. BG: What in your view is the biggest threat to Burgundy as we know it? BW: My 4:00 AM fear is that genetically modified yeasts will take over. BG: You mean the yeasts that you can buy in bags at wine making stores? BW: No, not just the industrial ones, genetically modified yeasts. Yeasts are invasive and they have a lot to do with the taste of wine. Each vineyard can have its own yeasts, and that's a lot of the taste of the wine from that place. I'm afraid of the market pressures that result when people say 'We don't want to wait 10 years to drink this wine, we want to drink it quickly,' for example. Yeasts used for things like this can take over the taste of wine. BG: You've done 30 years in this business. What are your goals for the future? BW: (Without hesitation) To spend more time in the vineyards. To stand there, to absorb, to look around, to touch, to feel. BG: You want to work the vineyards? What would you do there? PW: You want to be a resource for them. BW: Yes. I want to be in the vineyards more. PW: I want to find a way to communicate more effectively, to create educational opportunities. I've been working with people on a project in New Orleans, the Independent Champagne & Sparkling Wine Invitational, and I'm really excited about it. I want to create more opportunities like this to showcase the kind of wines we believe in and to help educate people. BG: How do you feel about blogs and other new media in the realm of wine writing? PW: Blogs need to be more accountable. The blogosphere is helping to perpetuate the fallacy that flaws can be terroir. I've had wines that are flawed - plain and simple, but I'm seeing a small niche in the blogosphere that is confusing these flaws with terroir. Many bloggers just don't have enough classic tasting knowledge to be able to understand the difference between funky wines that show terroir and flawed wine. On the other hand, it's much harder to get things into Wine Spectator than it is to get things into blogs. BW: I like the blogs. There are some you want to read because their voice appeals to you, others don't. I'm glad that there's a lot of wine talk out there. BG: What do you find yourselves drinking these days when you're drinking wine? PW: We get equally excited drinking Passetoutgrains as we do drinking Clos de Chênes. It depends on the food we're eating. If we're having a simple Sunday roast chicken lunch, we drink Passetoutgrains or Bourgogne and we love it - those are great wines. For me it's about context and about the wine being ready to drink. BW: Yes, that's very important. Drinking Grand Cru or 1er Cru wines when they're young is a shame. Young wines are like young people - they haven't found their personalities yet. BW and PW: (Plaintively) Can we go now? BG: By the way, thanks for spending so much time talking with me. BW: It's my pleasure. All of this is pre-obituary and it's good for me to do. BG: (Nervous laughter, followed by throat clearing and vigorous subject-changing) So, I'd like to learn about pricing in Burgundy. How do you decide the prices for each bottle? PW: We don't, we're sent a price list each year and that's basically it. If we feel that we want to change the prices some, we can work with the producers on that. We might feel like we want to come down on the villages pricing, and to compensate we'll go up on the 1er Crus, for example. BG: Are you selecting the barrels that you want and the wines that you want? PW: No, we're given an allocation and that's what we take. BG: Why would you want to adjust the pricing - why down on the villages, for example? BW: You have to understand something - it is always easy to sell the top wines. The Grand crus and the top 1er Crus sell out very quickly, there's never a problem. Even in off vintages, even in a recession, these wines sell. Restaurants buy them, good retailers buy them, there's just never a problem. It's the everyday wines, the Villages wines, the Bourgognes, that are hard to sell. It takes 3 visits a year from me and eight months on the road for Peter to find the right home for those wines every year. BG: Wow, I'm surprised to hear that. I guess I understand that Lafarge's Clos de Chênes should always be a pretty easy sell, but you're saying that his villages Volnay, and his Bourgogne are tough? PW: Always. People buy based on the lofty reputation of the wines and not on what's good to drink in the near term, what's appropriate for current drinking. BG: Can you give me an example of how this works with one of your producers? PW: Take Freddy Mugnier. I can sell Musigny and Amoureuses no problem. Marechale, which I think is one of the best Nuits st. Georges 1er Crus out there, that wine is very hard to sell. His Villages Chambolle, which is a blend of young vines from great vineyards (he said which ones but I didn't note them), always a hard sell. And this is great wine - I 'm always super excited to drink Freddy Mugnier's Villages wine. But to sell it, I have to tell people "You want Amoureuses, no problem. But you're going to have to step up to the plate on Marechale." PW: If I let anyone who wanted it buy Amoureuses and only Amoureuses, the price would absolutely skyrocket. BG: Yeah, I guess you'd lose a lot of Villages sales, and also there would be much greater demand for Amoureuses if it wasn't bundled as part of a much larger purchase. BG: You mentioned the economy before and that it doesn't impact sales on the top wines. I feel like it impacts the market for those wines somehow, though. I'm seeing top wines I don't usually see on shelves. I've seen 2007 Mugnier Musigny on two retail shelves in NYC recently, and I haven't seen that in a long time. BG: Chambers Street and Uva, in Brooklyn (and since this conversation I saw it online at another NYC area store called Grapes the Wine Company). PW: I think Chambers' is gray market, but that's great. BG: Yeah, but here's another issue with pricing. I'm not questioning the greatness of that wine and others like it. But I think it's sad that people who come to wine now, like myself, unless we are very rich, will never taste a Mugnier Musigny. The '07 vintage is something like $450 a bottle. And it's sad because people who love art can go see it at a museum for a reasonable price. People who love opera can pay various prices to hear it live. But Musigny - an incredibly tiny portion of the wine loving population will experience it, and it's sad. BW: (A frown darkens her expression for a moment) Yes, it is. But you need to know that people like Freddy Mugnier and Christophe Roumier are horrified at the prices charged for their Musigny. Some of this is the awful dollar. It's hovering at about 1.5 to the Euro now, and that makes it very hard. But there are ways to drink these wines. I remember teaming up with seven or eight people and going in together on a great bottle so that we could all taste it (but good luck reconvening those 8 people after the 15 years it takes to properly age that wine - ed.). PW: Do you realize that these people make maybe 3% profit? Mugnier cannot afford to drink his own Musigny. BG: That is absurd. So are there still undiscovered producers in Burgundy? BW: Of course there are! Kids come home and their parents used to sell to the négoce, but they want to make wine under their own label. Brothers and sisters inherit vines and begin to produce wine, things like that. PW: Do you know how we select who we're going to represent? We eat lunch every day with our staff and we drink wine. If we're moved by the wine then we go to meet the people to see if we want to work with them. Our business is very personal and we have to want to work with the people we represent. We literally do not sell what we do not drink ourselves - the lowest wines too, from Bourgognes to0, We happily drink everything that we sell. The American wine icon Becky Wasserman is in New York City to celebrate the 30th anniversary of Le Serbet, her wine exporting company. Becky got started when very few people here in the United States knew anything about wine from Burgundy, and when very little was available in retail shops. She is considered to be one of the architects of the Burgundy wine market and she is respected and admired by everyone I know. Becky works in Beaune and lives with her husband Russell in a village called Bouilland, in "the back coast" behind Savigny-lès-Beaune. I was lucky enough to spend a few hours the other day with Becky and her son Peter. It was my first time meeting her and it was a wonderful opportunity to hear the story of how she created her business, to hear about her and Peter's experiences as Burgundy wine merchants. I found them both to be absolutely lovely people, easy going and down-to-earth. They are wine rock-stars, but they are the gentle folk who you want as your neighbors (although I don't know how loud she likes her music), your co-workers, or your lunch companions. I did my best taking notes, but my transcription of our conversation is mostly paraphrased. Also, both Becky and Peter were answering my questions and our discussion was lively - I am not always sure whether it was Becky or Peter who said certain things, and you'll just have to forgive me for that. They share about 50% of their DNA, so who said what isn't so big of a deal, is it? BG: How did you get started in the wine business? BW: (Lots of awkward laughing with Peter immediately ensues) I was an artist's wife. We moved from Philadelphia to Burgundy in 1968 for my husband's art. As a girl in Manhattan, anything French made me shiver, so this was a dream for me. I had two young sons. My husband was a wine connoisseur - there weren't many wine collectors back then. He was, however, a collector of mistresses, and so our marriage was ending. I knew that I needed financial independence so I wouldn't have to rely on my husband after we parted ways. I was thinking about work as a bilingual receptionist at one of the Beaune hotels, but I knew a cooper in Saint Romain who asked a favor of me. He was owed a debt and he asked if I would go to California to get the money from this wine maker. BG: Was this a pulp-fiction underworld kind of assignment for you - did you carry a pistol? BG: (Shifts uncomfortably in chair) Okay, go on. Sorry. BW: I developed a small business brokering sales between this cooper and California wine makers. I would take the California wine makers to taste at the famous domaines, I would translate for them, and translate their negotiations buying barrels. I can't remember who it was, but I think it was Diamond Wine Merchants in California, he asked me for a list of producers to import, and that was the first list I did. BG: Which producers were on the list? BW: Pousse d'Or, when Gerard Potel was making the wines, Aubert de Villaines wines from Bouzeron, Burguet, Bachelet, Roty, although that didn't last long, some producers from the Mâconnais and something from Corbières. This was pioneer work - they bought a few cases and tried to place them. Then a second importer asked for a list, and then a third took my selections. I was Kermit Lynch's agent in Beaune from 1977 - 1981 also. BG: Were you working on your own business at the same time? BW: No, he liked to keep things exclusive. BG: How long did it take to make your's a workable and successful business? BW: Yes, it's hard to earn money when you only work with quality. BG: What was the biggest challenge you faced in business? BW: In any business, the lovely parts are lovely, and people always think that my business is all lovely. But that's this much of it (holds up two fingers pinched together), and then there is a lot of work that's just business. Getting people to pay their bills was difficult at first. The French union rules weren't easy to navigate - we had truckers who would arrive at a domaine, but wouldn't load wine onto the trucks. Or they wouldn't unload it. There could be an old lady and her grandchild and no one else there, but the driver would not lift those cases. BG: Wait a minute - how could people just not pay their bills? Wouldn't that mean no one would work with them? PW: It happens all the time. People pay according to a schedule, not upon delivery. And if they didn't pay, it could take years to sort out a resolution. Nowadays our importers are fantastic about this - they all pay on time. If one runs into trouble and cannot pay, we work something out together. but in the beginning, this was a real problem. BG: You mentioned that the lovely parts are lovely. What are those parts? BW: There are moments of unimaginable and gorgeous pleasure. Standing in the vineyards, realizing that the interaction between soil and vine has been going on for hundreds of years in this spot, feeling like I'm part of the cycle. PW: And knowing that we contribute to the family lives of our 96 producers - they send their kids to school, they live their lives, and we have something to do with that. BW: And knowing that we're fighting against the death of individuality. Despite the rise of artisinal cheese and things like that, there is a lot of pressure against individuality, and we're fighting that in what we do. There are some great cheeses produced in New York and Vermont. Local cheeses have achieved, in my opinion, higher quality within the cheese world than local wines have within the wine world. One of my new favorites is a raw milk washed rind cheese called Hudson Red, made by Twin Maple Farms Creamery and distributed by the ersatz coop Pampered Cow Cheese. Hudson Red is not the stinkiest of washed rind cheeses, but it's not tame. Fresh and grassy with a creamy texture, and a pungent finish, this cheese had character. And it's completely delicious. I like highly aromatic wines with washed rind cheeses - Gewurz or Muscat perhaps, but Hudson Red is on the mellow side of the washed rind spectrum. We've had this cheese several times now and I have yet to find "the right wine." No calamities, but nothing inspiring either. When I thought about eating it this time, I imagined it pairing well with a demi-sec Chenin Blanc, and so we went with one of François Chidaine's wines. 2005 François Chidaine Montlouis sur Loire Les Tuffeaux, $23, Louis/Dressner Selections. In a great place right now, this seems to have shed most of its sweet and tender baby fat. Still decidedly an off-dry wine, but the residual sugar is less prominent than it was a few years ago. The wine has achieved a better balance now, and some how seems fresher than it did a while back. Numbers say the wine is still young, but the intensely woolly notes suggest something a bit more mature to me (wool in background of photo represents woolly tones - ed.) I think this wine has his a comfortable stride - it's drinking beautifully right now. I have only one bottle left, and I might try to hold it for a while, but if I had several of these I wouldn't hesitate to open one soon. That said, the pairing with Hudson Red was merely good, not great. The woolly, green tea, roast nuts of the wine played alongside, not with the cheese. This wine might have done better with a young chalky goat cheese from the Loire Valley. And I'm still unsure of the perfect wine for the lovely Hudson Red. Thanks to the generosity of a friend, I had the opportunity recently to drink two incredible wines made by the late Didier Dagueneau. I had never had a Dagueneau wine, and after just these two bottles, I understand what it is I missed. You probably know that Didier Dagueneau died in September of 2008 when the plane he was piloting crashed. Although his children have taken over the estate, it is fair to say that unless I find and purchase back vintages, I have missed Didier Dagueneau's wines. By the way, one could say that in drinking the 2007's, I didn't really drink his wines. He made the wines, but he wasn't there for elevage and bottling.. I was pretty much blown away by the two wines I drank - I've never had finer Sauvignon Blanc from anywhere. And it's silly to say it that way because these wines, and from what I've read, Dagueneau's wines in general, are not about Sauvignon, but more about the specific plots where they are grown. I have little context to offer you here. I cannot compare these to other vintages of Dagueneau, and I've had only a few Pouilly-Fumé wines, so this isn't about why these wines are so much better than the others. If you're interested in a bit of context, here is a decent place to start. I want to share what it was to drink these two bottles because of their astonishing radiance and beauty. I was surprised at how great these were because of all of the hype surrounding this producer. Think of seeing the Mona Lisa in person - you know how beautiful it's supposed to be, but you've never seen it and it becomes more of an icon than a reality. And then you see it, and it surprises you with the power of its actual beauty. So I hear - I've never seen the Mona Lisa. And by the way, I had no agenda whatsoever. I wasn't hoping to like Dagueneau's wines because the man is a deceased icon. In fact, it took me the course of an evening with them to understand how incredible they were, to the extent that one can understand a wine after drinking two bottles. 2007 Didier Dagueneau Pouilly Fumé Pur Sang, $90, Louis/Dressner Selections. the thing that killed me about this wine was how perfectly and completely clear it was. Unadorned, spare, elegant, graceful, this wine simply rests on the tongue and in the nostrils. It is an intense and weightless ray of stony citrus fruit with a quiet buzz of energy that lingers past the finish. A lovely wine on the surface, but this is one of those wines that rewards every iota of concentration that you give. It was growing still as I finished it. 2007 Didier Dagueneau Pouilly-Fumé Silex, $100, Louis/Dressner Selections. Clearly the same author, but a different kind of storytelling. This wine, for me, was defined by its unmistakable flintiness, that slightly smoky stony...flinty sense on the nose. Bigger in body than the Pur Sang, and whereas the Pur Sang was about its seamless balance, this wine showed off its complex and intense flavors of flint-infused ripe fruit and mineral water, but still delivered in a package that is all silky refinement, all class. I loved both wines - they were beautiful in a way that makes you rethink what you know about Sauvignon Blanc from the Loire. And I cannot say that I preferred one over the other because they are so different. I might prefer Pur Sang as an apertif, and I might prefer Silex with seafood. I might prefer Pur Sang with fresh goat cheese and Silex with harder aged goat cheese. And this is '07 I'm talking about. I only wish I could have tasted these wines in the past. Those old bottles are, sadly, out of my price range now. The other day I was reading an excellent article in the current issue of The World of Fine Wine, an article that makes the case for Beaujolais as a "fine wine," the same way we think about Burgundy or Barolo, for example. I cannot link directly to the article, as The World of Fine Wine doesn't publish content online, but you should subscribe anyway. Like The Art of Eating, this is a must-have. 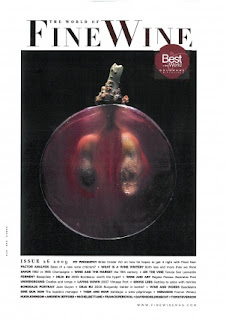 Some of the very finest wine thinkers write for WOFW - this Beaujolais piece, for example, is by Peter Liem. The expression of terroir demonstrates the intellectual side of cru Beaujolais, but another element that is often ignored, particularly in an environment driven by professional blind tastings and numeric scoring, is sheer drinkability: the capacity of a wine to compel us to keep returning to it over and over again. Somewhere along the line, the notion of deliciousness seems to have become, if not pejorative, then at least frivolous—as though we should feel guilty for delighting in a wine’s visceral pleasures. There are many directions one could go with this idea. It makes me think of how I tend to undervalue wines if they are inexpensive, even if like Muscadet for example, I love the wines. Or the amazing and substantial $16 bottle of Ott Gruner Veltliner I recently had - why didn't I load up on that wine? I ran out and bought some $40 Hirsch Riesling after tasting those wines, why not the cheaper wine that offered little other than deliciousness? It makes me think about how complexity implies quality, and although I enjoy complexity, why does the degree of complexity correlate with the way we experience quality? It makes me think about a lot of things. I was lucky enough to be invited to the recent Blaufränkisch tasting and luncheon at Gramercy Tavern, organized by David Schildnecht. First of all, let me tell you that there are a great many worse ways to spend the lunch hours between 12-2 pm than by sitting in a private room at Gramercy with a gaggle of smart wine writers and friendly Austrian wine makers, eating what had to be 7 courses and drinking good wine. This was a challenging tasting for me. Firstly, I had almost no previous experience drinking Blaufränkisch. Secondly, no information was provided about the producers or the wines - no fact sheets, no bios, nothing. It was a choice between attempting to write the names of Austrian producers and wines that I was entirely unfamiliar with, or to simply drink the wines and consider them in what was for me essentially a blind format. But this worked out well for me - I had no preconceived notions, no biases. I was a clean slate. And everyone else had some familiarity with the producers and wines - I was the lone idiot, so this is not a knock on the organizers. As an example, I did not know during the tasting that Roland Velich of Moric is a superstar that Peter Liem compared to the wine maker at DRC in his ability to coax greatness out of his terroir and his grape. And this certainly shows that I am not a distinguished taster of Blaufränkisch, but I was not moved by his wines. In general, I liked the wines and I am quite curious to drink Blaufränkisch again, preferably at home with dinner (when asked, the producers suggested that one of the best pairings for Blaufränkisch is simply prepared beef). But as Eric Asimov noted in his post, I thought that some of the wines were made in a style that didn't seem to compliment the raw material. We began with four white wines, and I was very impressed with two of them. The 2007 Prieler Pinot Blanc Seeberg was just delicious. Lean, focused, and completely dry, this wine was full of orchard fruit pits and peels. It was fresh, and eminently drinkable, and should cost about $25. The 2008 Umathum Traminer was a tasty and interesting wine. A blend of red and yellow Traminer from 45 year old wines on slate soils, this wine was vivid and expressive, and also completely dry. It should cost about $30. With these two wines, there was nothing that got in the way of the fruit and soil. Not so for the other two. The 2007 Moric Gruner Veltliner had a beautiful chalky and grassy nose and the broad and airy character of a wine that is fermented in oak. It didn't handle its alcohol very well, however, and the palate was not as harmonious as the nose. I found this wine to be intellectually interesting, but I'm not sure whether or not I'd want to drink it with my dinner. The other white was a Pannobile Chardonnay that I thought was completely overwhelmed by vanilla oaky aromas. That kind of sums it up for me - the raw material seems to be of very high quality, the producers care about their impact on the environment and many are using biodynamic, organic, or sustainable techniques, most are fermenting with natural yeasts, and everyone's heart is in the right place. But some are subjecting their wines to an oak regimen that, to my taste, doesn't promote the best in the wines. Of the reds, there were two producers whose wines really stood out for me. I very much enjoyed the wines of Uwe Schiefer. Schiefer is a veteran of the young Burgenland Blaufränkisch scene. His 2007 Blaufränkisch Reihberg, from vines between 45 and 80 years old on the Eisenberg hill (Eisenberg is considered to be the finest Burgenland Blaufränkisch terroir) was energetic and showed great purity. It is a balanced and expressive wine that showed something of the spicy, savory, fleshy characteristics that I now understand are typical of Blaufränkisch. It was very well balanced and I imagine that it would cellar very well. Schiefer also poured his 1999 Blaufränkisch Reihberg and I loved it. The nose was vividly floral, and the palate showed a lovely grassy, peppery undertone, but very mellow. The finish was long and left a pleasant menthol fragrance. I was surprised to hear that this wine saw 100% new oak. So it's not as simple as whether or not they use lots of oak - clearly there are other factors at play. I also loved the reds by Murh-Van der Niepoort, although these wines were an anomaly in this group, as they are from Carnuntum, a region to the north of Burgenland. The producer said that she is most interested in freshness, and this is apparent when drinking her wines. I liked the weird savory roasted vegetable flavors of her 2006 Carnuntum Spitzerberg, but the 2007 was as good as any wine on the table, with beautiful floral aromatics and an ethereal texture that allowed the layers of fruit, soil, and flower to unfold gracefully. I don't know the prices of the red wines I just recommended, but I bet that they are not cheap. I'm guessing a minimum of $50, perhaps more. If I'm right, these are not easy wines to experiment with, to just buy a bottle to see whether or not you like it. Blaufränkisch is one of the parents of Zweigelt, a more commonly grown red wine grape in Austria. I am currently in possession of several liters of absolutely delicious and I would say terroir-expressive Zweigelt wine. I paid under $11 for each of those liters. I might feel differently one day, and there are people who are far more erudite than I who can argue differently, but right now I'll take my chances with Zweigelt for $11. Several people brought appetizers. Above from left to right, we enjoyed sautéed wild mushroom toasts with lingonberries, strawberries soaked in aged Balsamic vinegar, and fresh figs stuffed with chopped almonds and bacon. We then had several seafood courses, beginning with the above crudo of yellowtail with fava bean and preserved lemon purée. Pike dumplings were fluffy and gorgeous, spiked with the tiniest bit of finely chopped gherkins and served with a bracingly clean cucumber salad and a dab of sour cream. These dumplings, I might add, were most generously donated by the good folks at Michael Skurnik Wines, who feel that pike dumplings should be part of any good dinner. And based on their performance at this dinner, I cannot argue at all. We then enjoyed the classic Sole Meunière, its delicate white flesh redolent of butter and the ocean. Perhaps in this particular case, too much butter, but who's complaining? Our final seafood course was quite memorable, some might say shocking. 18 fresh vanilla beans were added, along with the juice of 6 pineapples and 6 guavas to 4 gallons of seawater, in which several lobsters swam about, marinating so to speak, for three days. Said lobsters were then boiled in this marinade and served on a limestone platter arranged around a centerpiece of raw honeycomb. The people who brought this dish thought it would be dramatic to serve it amidst a swarm of bees. It was, in fact, dangerous eating, but entirely delicious. Before moving onto the meat courses, we wound down with the above savory and delicious chicken noodle soup garnished with thinly sliced oyster mushrooms, and a pinch of thyme. Our first meat course was a beauty. Two kinds of venison carpaccio: the first was smoked and topped with sea salt, the second merely raw and unadorned. The chef twice said the word "cloves" while preparing it, but didn't actually use cloves in the preparation. Duck confit was rich and toothsome served next to thinly slices of rosy breast, served with braised turnips, daikon radish, and spaetzle. At this point, everyone was quite stuffed. We did, however, have one final meat course which I forgot to photograph. It was the richest and bloodiest of sirloin steaks, served with buttermilk and rosemary mashed potatoes (2000 Grace Family Vineyards Napa Valley Cabernet Sauvignon and 2003 Vincent Paris Cornas). Stuffed as we were, everyone made room for dessert - an incredibly rich, yet impossibly light tangerine and Earl Grey tea souflée. I loved it, and greedily devoured the remains the next day all by myself. When you have a meal this good with good friends, the wine pairings become irrelevant. Trust me, we drank good wine too. I've been drinking a lot of dry sherry lately, and I think I've really caught the bug. It's such a delicious style of wine, so tangy and fresh, so long and complex, so great with many different types of food. And dry sherry is so inexpensive. The most you can spend on a great bottle of Fino or Manzanilla is about $50, and that's really just the Equipo Navazos wines. Excellent bottles typically cost between $15 and $25. I've seen 375 ml bottles of good quality Manzanilla for $9. It's not only about good prices though - these are very fine wines, and their low prices simply sweeten the deal. I'm just beginning to learn about sherry, and one thing that I find challenging is the oxidative character of the wines. I love the pungent aromas and flavors, but sometimes the oxidized character dominates my palate's memory more than the other aspects of the wine, and I still have a hard time differentiating one producer's wine from another's. I thought it would be interesting and fun to drink many sherries at once, to compare them in the hopes of better understanding what lies below the flor. So the Brooklyn Blind Tasting Panel convened over a load of Manzanilla, the dry sherry made on the humid coast of the Atlantic at Sanlúcar de Barrameda. BrooklynLady and I were joined for this tasting by Eric Asimov, wine critic at the New York Times, Peter Liem of ChampagneGuide.net, and Rafael Mateo, owner of Pata Negra, the East Village tapas bar. An illustrious panel, to say the least. And if you don't think this paragraph was fun to write, you're crazy. We tasted two flights of four wines and selected our three favorites. A few general impressions before sharing individual notes: overall quality was very high. Everyone agreed that the wines showed tremendously well. I thought the wines changed a lot in the glass, and I can say from sampling the leftovers the next day that they continue to change and improve with air. It is commonly said (sometimes even on the back label of sherry bottles) that sherry is meant to be consumed immediately after opening. Seems to me that immediately upon opening is when the wines are at their most awkwardly pungent, their most volatile. I tend to prefer them with a few hours of air, sometimes even the next day, when they are more mellow and harmonious. Herederos de Argüeso Manzanilla San León Clásica, $12 (375 ml), a Jose Pastor Selection, Imported by Vinos & Gourmet Inc. Three people picked this as their overall favorite - BrooklynLady, Eric, and myself. BrooklynLady thought it was classic dry sherry. Eric liked its salty sea air, tangy quality. He felt that it would have been a perfect Manzanilla except that it wasn't precise, it was a bit unrefined. I didn't care for this wine at first, as I found something like chlorine on the nose, but I came back to it several times over the course of the flight and I was captivated by the combination of ripe appley fruit and brisk saline character. Peter liked it too but felt that the alcohol stuck out a bit. 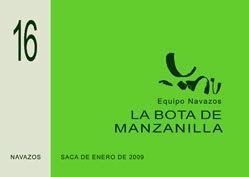 Equipo Navazos La Bota de Manzanilla Nº 16, $39 (750 ml), Eric Solomon Selections, Polaner Imports. This was Peter's favorite wine of the tasting, Eric and Mateo had it 2nd. Equipo Navazos chooses their favorite barrels from their favorite estates and then bottles them with only the lightest filtration, something that is very unusual in the world of sherry. Peter loved its amazing texture, its complexity, and its umami/meaty notes. He said that the wine made him hungry. Eric thought it was analogous to the San León Clásica, with a tangy petrol complexity. This wine really stuck out for me in the tasting, so much so that I had a hard time with it. It was much bigger and richer than the other wines. The nose was spicy and showed some caramel notes, something like rubber too. It was bold and savory, and I liked it, but I couldn't reconcile it with the other wines we tasted. The funny thing is that I drank this wine last summer at Keith Levenberg's BBQ and it seemed sheer and light next to the La Bota de Fino Nº 15. Peter suggested that it's richness and depth are due to the very old wines used in the blend (old wines can be labeled Manzanilla, but young wines cannot be labeled Manzanilla Pasada). I would like to taste this wine again, perhaps once it's been open for a day or two. Pedro Romero Manzanilla Aurora, $12 (500 ml), Frontier Wine Imports. Peter had this wine 2nd, Eric and I listed it 3rd. Peter found the wine to be exotic, reminding him of soy and roast pork, like Chinese food. As with the La Bota wine, Peter noted and appreciated the character imparted by the old wines in this blend. Eric found this to be the most vinous of the sherries, and liked its nuanced and low key brininess. I sampled this wine the next day, by the way, and it was seamless and perfectly harmonious. At $12 for a 500 ml bottle, I would call this the best value of the tasting. Bodegas Hidalgo Manzanilla La Gitana, $16 (500 ml), Classical Wines Imports. I liked this wine more than anyone else, placing it 2nd. Mateo and BrooklynLady both had it 3rd on their lists. I thought it was delicately floral and a bit musky, and I enjoyed the whiff of tangerine I was getting. Mateo found it to be juicy and salty, and thought of it as a sassy black sheep among the other wines. BrooklynLady thought the finish was delicate and delicious. Eric thought that the wine was too young, that it was not yet evolved. And it's true - it turns out that La Gitana is made of young wines. Emilio Lustau Solera Reserva Manzanilla Papirusa, $15 (750 ml), Selected by Christopher Cannon, Michael Skurnik Imports. This was Mateo's favorite wine and Peter listed it 3rd. Mateo thought it was classy and sophisticated, "like a woman who wears pearls but doesn't feel old." Peter called it "super-classical," and liked its salty, tangy finesse. Eric liked it least of all the wines, finding it's Manzanilla elements to be buried underneath oak aromas and flavors. Gaspar Florido Manzanilla Pleamar, $12 (375 ml), VOS Imports. This wine was quite rich without having the underlying character necessary to hold one's interest. Mateo called it "fool's gold." Eric found it to be sedate and not complex. I liked the way the rubbery notes played with the rich brown sugar notes on the nose, but the wine simply didn't follow through on the palate. Hijos de Rainera Perez Marin La Guita Manzanilla, $9 (375 ml), Imported by Ibañez-Pleven Offerings. I found this wine to be too sweet, with a spicy caramel aspect that dominated the palate. It was Mateo's least favorite - he said it was going in too many directions. Eric liked the subtle spicy flavors, but thought the alcohol stuck out. Peter thought the wine was delicious, but said that he would not have guessed it to be Manzanilla - it was too round and rich, more like a Fino, he said. By the way, a few days before the tasting I drank this wine over two days and loved it. Context is everything, I guess. Or perhaps the other wines are even better than this. Sadly, our bottle of La Cigarrera Manzanilla was flawed, $14 (375 ml), Imported by De Maison Selections, with a weirdly chemical nose and a cidery palate. It's not easy to understand terroir in Champagne. I don't understand it. I know that certain areas are better for Pinot Noir, let's say, and that some villages are known for certain characteristics. But it's much easier to understand what I read about terroir than it is to understand it while I'm drinking Champagne. After all, the wines tend to be a blend of grapes from different villages and different vintages. And then there are those distracting bubbles. ...a blanc de blancs from a 40-are parcel of ungrafted chardonnay vines in a vineyard called Les Sables, planted between 1951 and 1960. The soil here is very sandy and siliceous, preventing phylloxera from penetrating it, and these vines have thrived on their own rootstocks, although attempts at planting vines in other areas of the same vineyard have failed. The idea of this ungrafted cuvée is to reflect the personality of the terroir as expressed by these special vines, and it’s not necessarily intended to be a vintage wine: “The character of the site is stronger than that of the year,” says Tarlant. “This parcel isn’t always necessarily representative of the vintage.” The first release was based on the 1999 vintage, blended with roughly 25 percent of 1998, while the follow-up version was made entirely from the 2000 vintage. 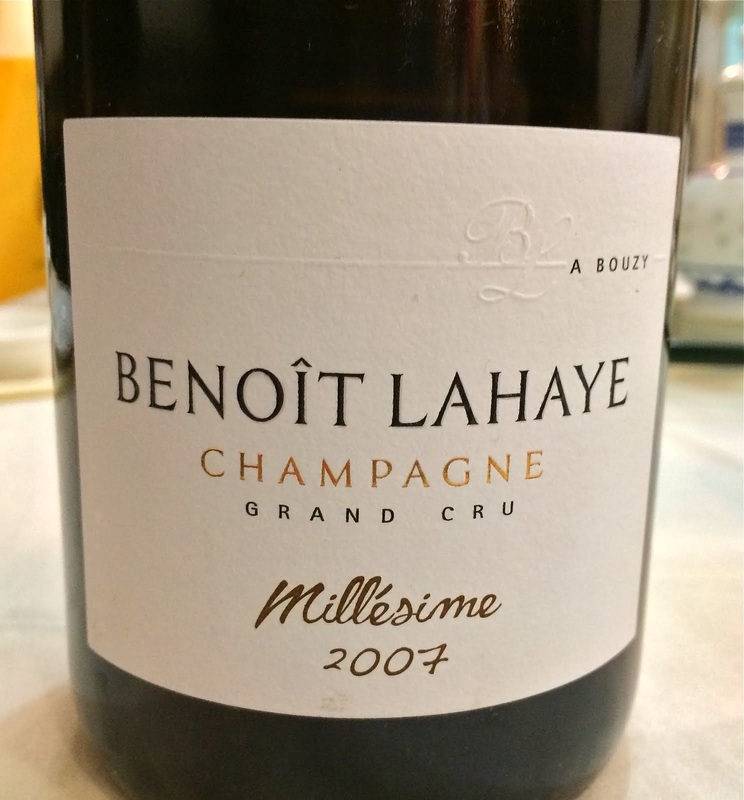 The back label gives the disgorgement date - February 23, 2006, but not the vintage. We guessed while drinking that it is based on 1999, but we could be wrong. As Peter mentions in the quote above, this wine can be more about the sandy vineyard of Les Sables in the village of Oueilly than it is about vintage or grape variety. With this bottle there is fruit, but it's mostly incidental - it is ripe enough to make a balanced and delicious non-dosed wine, but it honestly fades into the background, more and more so with air time. The wine was delicious immediately, but two hours later it was in a perfect place, vibrant, focused, and completely harmonious. What stood out at that point was soil - a definite earthy, sandy tone that carried throughout the bright and savoury finish. This is a wine to get lost in. NV Diebolt-Vallois Champagne Cuvée Prestige Brut Blanc de Blancs, $65, Imported by Petit Pois. Fellow blogger David McDuff very kindly gave me the gift of Cuvée Prestige a little over a year ago when my younger daughter was born. As you can see right above the 12.5% alcohol designation, this bottle is marked 'L.05,' which means that it is comprised of about 50% 2004, the rest 2002 and 2000 (but I am not sure of the exact percentages). This wine comes mostly from old vines in Cramant, one of the best villages for Chardonnay in the entire Côte des Blancs. It is a big and rich wine, full in aromas, texture, and flavor, and it is completely and totally delicious. The wine changes a lot in the glass, and at times the fruit character borders on tropical. But as the wine changed, there was this definite foundation that was always present, this persistently chalky sensation on the finish. And that, Peter said, is one of the hallmarks of Cramant, richness of fruit along with this incisive chalky underpinning. I woke up the next morning and happily discovered a nice glass of this wine left in the bottle (we had a bit of wine the night before, you see, and I didn't neaten everything up before going to bed). This warm, flat glass was the best of all. Such grace and harmony, such richness with such clarity of fruit (pineapple! ), such silky texture. I want more. One last comment: far be it from me to tell you what to spend your money on, but both of these wines represent incredible value at $65, considering the absolute top quality of the wines. I drank a bottle of wine the other night that was fantastic as any bottle I've had. I should say right off that you will most likely not be able to buy this, should you wish to, and I know that can be annoying. It's a back vintage of a wine that is very expensive and difficult to find even when new vintages are released. But I want to share my experience with it anyway because it was so thrilling. Malconsorts is the southern most 1er cru in Vosne-Romanée, right on the border with Nuits St. Georges. Directly to the north is the legendary La Tâche, the Grand Cru vineyard owned entirely by the Domaine de la Romanée-Conti. Some of the Malconsorts vines are actually located in La Tâche, almost surrounded. Photo courtesy of Sylvain Pitiot & Pierre Poupon's Atlas des Grands Vignobles de Bourgogne. You can see the small rectangular plot at the south-eastern end (south is left in this picture) of La Tâche - an arrow indicates that the plot is part of Malconsorts. The areas marked number 5 in black circles are the three parcels that together make up Les Gaudichots, a tiny but remarkable 1er Cru that used to be very large, containing much of what is now La Tâche. There are several great 1er crus in Vosne-Romanée, Malconsorts is just one of them. You can read more about these vineyards in the Vosne-Romanée Village Profile at Burgundy Report. It's pretty safe to say that I will not anytime soon be buying and drinking La Tâche. But Malconsorts is not a bad substitute, and although it's way too expensive for me to purchase with any regularity, if I could drink one bottle a year I would be immensely pleased. I drank a bottle the other night, the 1998 Hudelot-Noellat, and it was absolutely amazing. 1998 Alain Hudelot-Noellat Vosne-Romanée 1er Cru Les Malconsorts, $75 at auction, Old Vine Imports. The fruit is rich and dark and there complex spice aromas too, but these descriptions are two dimensional and don't do the wine justice. There is a thrilling amplitude and depth to the aromas. Thrilling as in thrilling. I'm not using a hyperbolic adjective for the mere sake of doing so. I was thrilled by this wine! The nose had so many dimensions, and such incredible clarity and detail. The palate is perfectly balanced, and still shows good acidity - it is not yet fully resolved, and this wine probably hasn't even peaked yet. This wine is a true gift, and I wish that anyone who loves Burgundy could have been there to share it. It's wines like this that make me question everything about the way I bought Burgundy over the past three years. One bottle of the current vintage (if you can find it) costs the same as two bottles of some or other villages wine, but for me, this wine offers far more pleasure than those two villages bottles ever can. I would happily trade in all my villages wine for far fewer bottles of this Malconsorts, or bottles from other top 1er Crus. My new strategy: drink far less Burgundy of far higher quality, and buy great wine from other places when I'm spending $25-$45. Almost two years ago, I think it was, I tasted this wine alongside the 1990 vintage at one of Dressner's tastings. I remember being interested in both wines, not loving either of them, and finding the '90 to be more inviting. So I bought a bottle of the 1990 and we greatly enjoyed it. In the comments on that post, some people suggested that the '89 was an even better wine. I meant to try it, but I never got around to it. In fact, I drank the '90 again at a restaurant, where it did not show well - never really opened up, stayed kind of shrill and screechy the whole night. And this was after me promising my father in-law that it would be amazing. Yesterday my pal Peter came over for dinner and he had a bottle of the '89 in tow - 1989 Olga Raffault Chinon Les Picasses, Louis/Dressner Selections, about $65. Can I tell you that this wine was absolutely magnificent? And first let me tell you that at the Dressner tasting this wine came off as a bretty mess. The Dressner team is unsurpassed, in my opinion, at putting on excellent industry tastings - well organized, plenty of room to taste and think no matter how crowded they are. So it wasn't about the conditions at the tasting. Bottle variation? Could be, but I doubt it. Peter said that as he paid for the wine, David Lillie told him that "when this wine shows well, it's great. But not every bottle is great." But I don't think the Dressner team would have showed a lesser bottle at their tasting. Who ever opened it would have noticed and opened another bottle. I think it's just not realistic to think that a wine like this can be understood over a few minutes in a crowded room with the traces of 25 other wines on the tongue. This is not a new idea, I know, but it was very real for me last night as we drank this wine. We opened it right as Peter arrived, and it had nice exotic spices on the nose and also a big breath of barnyard. We left it alone for the next hour while we drank the fantastic remnants of the previous evening's Lustau Almacenista Gonzales Obregon Fino del Puerto Sherry, selected by Christopher Cannan, Imported by Michael Skurnik Wines, and cooked and ate my rather lame attempt at kinpira burdock root. 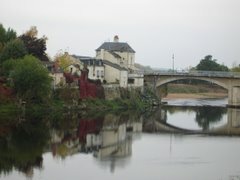 When we came back to it, the Chinon was just magnificent. The nose was complex with spices and stewed fruit, and had the great depth and dimension that mature good wine has. And the palate was fully resolved and showed amazing breadth and detail of flavor. It really spread out in the mouth and the fragrance lingered long after swallowing. This is what I hope my 2002 Raffault Chinons will turn into. This is what I hope all of my Chinons turn into. This was just beautiful and completely satisfying wine. And to think - I had all but rejected this wine based on a few minutes at a tasting. Let this serve as a reminder to me and to anyone else who cares: never never never do that. Tastings are great but they cannot offer the whole truth, especially regarding mature wines. They offer a cross section of the wine, but a wine like this changes every 15 minutes. At a tasting, you have no idea which 15 minutes you're in. There's no way to really understand until you drink the wine over the course of an evening. So...what if a mature wine by a solid producer is not so impressive at a tasting. Should I assume that it might be great and buy it anyway? That doesn't make sense. So why even taste the 1989 at a tasting? Perhaps it can do more harm than good, a la my Raffault 1989 experience. But I will never not taste a wine like that if I see it at a tasting. So how do you take your understanding of the cross section of wine you're tasting, and generalize from it in a meaningful way? I do not know the answer to these questions, I'm sorry to tell you. Please feel free to share any insights. Who doesn't love a nice pot of braised meat in the wintertime? I know I do. Every now and then I like to mix it up and make a Chinese-style braise. This works best, I think, with cuts of meat that have a lot of bone and gooey things like tendon. So when BrooklynLady came home the other night with several large shortribs, the braise was on. My wife was thoughtful enough to get shortribs that had been cut lengthwise so the bones were intact, as opposed to the cross section cut that is more common. One is no better than the other, but there is something about eating meat off so large of a bone that satisfies in an atavistic way. And when my 3 year old, who these days is more of a fruit eater than a steak eater, when she saw BrooklynLady and I pulling fragrant strands of meat off of these huge bones, she wanted in. Season the meat generously with salt and pepper 24 hours in advance of cooking. Let the meat come to room temperature before browning. Brown on all sides. Take the meat out of the pot, pour out most of the fat, lower the heat to medium and add one finely chopped large onion. Cook them well - until they're translucent. Add a glug or two of Sherry vinegar and scrape up the brown bits from the bottom of the pot. Let the liquid cook off (a minute or so) and then add seasonings. This time I used two cloves of crushed but not chopped garlic, one piece of star anise that I broke into many small pieces, 6 black peppercorns, and two whole dried chilis. Then add the braising liquid. For the liquid, I combined a half cup of good soy sauce, a half cup of mirin, a cup of water, and a tablespoon and a half of dark brown sugar. When this comes to a boil, add the meat back to the pot along with four strips of tangerine peel - no pith, just the peel (orange is better, but I didn't have one). I added a few carrots this time too, just for kicks. Cover with a piece of wet parchment paper under the lid of the pot and put into a 275 degree oven. Plan on about four hours, and turn the meat halfway through. Strain the braising liquid and reduce it a bit so it becomes more of a glaze. Like any meat braise, this becomes much more flavorful with some time in the fridge. Re-heat at 275 degrees with some of the glaze, and go to town. I like simple white rice as an accompanyment, and cucumber is nice too. Speaking of accompanyments, what to drink with this? As it was re-heating and the scents of soy, anise, and meat wafted through the apartment, I found myself wanting chilled sake. I didn't have any in the house, of course, so my thoughts drifted to Chambolle-Musigny. But I didn't have anything that's ready to drink, so we went with a 2007 Descombes Morgon Vieille Vignes, $28, Louis/Dressner Selections. This wine was closed down, opened way too young. It had some lovely spices on the nose and the texture was right on, but the palate was clamped down tight. I decanted it, gave it an hour and it was a bit better, but the old vines still weren't giving away any secrets. I should have opened the regular Morgon instead - perhaps it is in a more conversational mood these days. If you look at the left side-bar of this blog you'll see that with 2010, this blog enters its fifth calendar year. This is misleading, as I have been doing this for only three and a half years. In any case, enough time has passed so that I think it's worth stepping back for a minute. And I'll use the beginning of the new year as an excuse to do this. I am not in the wine business. I write this blog anonymously in an attempt to maintain some sort of privacy for my family and for myself in my "real" life. I started blogging as a way to record my learning about wine, and that's basically still what it is for me. Some things have changed, of course. I get to do much more than I did back then, as the New York City wine community has, luckily for me, welcomed me into it's folds. And when I write a post now I am conscious of that fact that there are people who will actually read it. But other than that, everything is the same. I'm still not in the wine business. I've still not had a bottle of 91 Rousseau Chambertin with dinner (or any vintage of any Chambertin with dinner, for that matter), I've never tasted DRC, I've never had anyone's Montrachet with dinner. Don't mistake me for some guy who has tasted and drunk the best wines of the world, because I haven't, and I never claim to be that kind of guy. I do drink a lot of wine, I like to think that I have a decent palate, and I'm learning as much as I can. I'm having an absolute ball doing so, and I'll continue to share whatever interests me with you here on this blog. Now that that's out of the way, I want to share a bit about something exciting from 2009. I haven't written about this yet because I couldn't figure out a graceful way to do so. And I still can't, but it was really exciting, and so this will have to do - Eric Asimov came to our house for dinner! Why did he come to dinner at my house? My mother would have you believe that he's mulling over some sort of fantastic job to offer me, and he needed to meet to check me out first. That's kind of cute in its own only-your-mother-could-be-that-patently-absurd way, isn't it? He came over for dinner because he loves to drink wine and eat (hopefully) good food, and because he probably gets mostly business invites, and this invite was personal. He came over because I have a blog and he does too, and because I invited him. (2005) Cédric Bouchard Roses de Jeanne Les Ursules Brut Blanc de Noirs - solo. This Champagne is delicate enough that I prefer to drink it on its own - no almonds, no nibbles, nothing. It was delicious. NV Equipos Navazos La Bota de Fino "Macharnudo Alto" Nº 15 with pickled herring. I love this Sherry, but it was the only wine that didn't show at its best that night. Three days later it was great, but at our dinner it was just good. And I'm still not sure if there really is a wine that pairs harmoniously with pickled herring. Sherry comes close. 2002 Luneau-Papin Muscadet de Sèvre-et-Maine Excelsior Clos des Noelles with fish soup. We decanted this wine and it was lovely. Young, but lovely, and to my taste, a harmonious pairing. Is there a better value in wine than Muscadet? I don't think so. 1993 Domaine Tempier Bandol La Migoua with steak, mushrooms, and winter radishes. When mature Tempier is good, it's really good. We got lucky with this one - it was really good. From another era, literally and figuratively. 2001 Dirler Gewurztraminer Grand Cru Kessler with a stinky Bavarian Muenster cheese. Although there is plenty of residual sugar in this wine, the vibrant acidity brings it into perfect balance and the wine doesn't seem sweet. It's not just about spicy exotic fruit - there are herbal and mineral flavors here too. I loved this wine, and there is a reason that the pairing of great Gewurz and Muenster is a classic. Anyway, he's a very nice guy, that Eric Asimov, and it was a thrill to have him over. I know what you're thinking - "how can Brooklynguy top that in 2010?" Well, I've invited Ben Bernanke and Timothy Geithner over (both big into Cali Cabs), and hopefully they'll get back to me soon. If they can make it, I really need to get started thinking about what wines to serve.